Blue delphiniums stand around this Cottage, worked in shades of blue and white. The flowers are formed by adding beads, included in the kit, making them stand out from the walls. 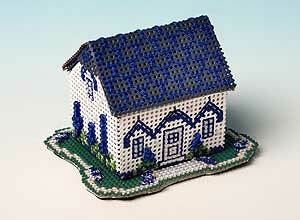 The roof of this cottage is removable, making it an attractive gift box.